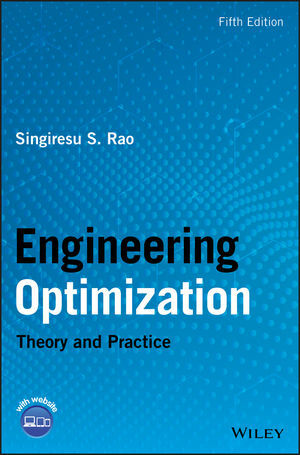 Engineering Optimization: Theory and Practice, Fifth Edition enables readers to quickly master and apply all the important optimization methods in use today across a broad range of industries. Covering both the latest and classical optimization methods, the text book starts off with the basics and then progressively builds to advanced principles and applications. This fifth edition has been updated to include four new chapters: Solution of Optimization Problems Using MATLAB; Metaheuristic Optimization Methods; Multi-Objective Optimization Methods; and Practical Implementation of Optimization. Each topic is written as a self-contained unit with all concepts explained fully and derivations presented. Computational aspects are emphasized throughout, with design examples and problems taken from different areas of engineering. This textbook includes solved examples, review questions and problems, and is accompanied by a website hosting a solutions manual. Singiresu S. Rao is a Professor in the Mechanical and Aerospace Engineering Department at the University of Miami. His main areas of research include multi objective optimization and uncertainty models in engineering analysis, design and optimization. He is a Fellow of ASME and an Associate Fellow of the AIAA.